This dramatic contemporary farmhouse is being offered for the first time and features 4 bedrooms, 3.5 baths and two story cathedral ceiling living spaces, which offers an abundance of light and views across the 7+ acres of pristine meadows and lush treetops. The house was built in 1996 by one of the Island's more prominent builders and is filled with innovative design features as well as quality craftsmanship. 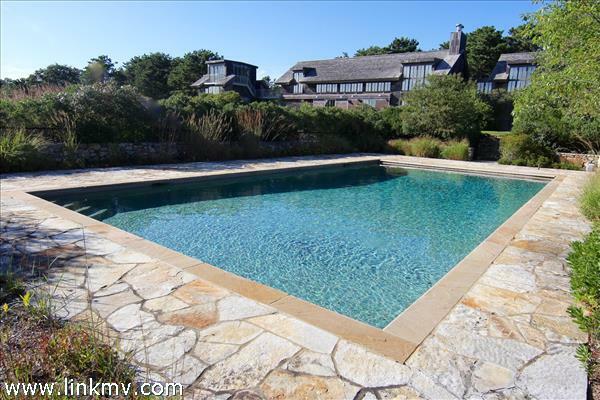 Complementing the property with its spectacular vistas is a large in-ground pool, attached garage with second floor office/artists studio, private tennis courts, and a 6-stall horse stable perfectly nestled at the far side of the property. This building could be converted into a legal guest house if preferred, or a new two bedroom guest house could be built additionally. This property is being offered FULLY FURNISHED. All of the above is located within the exclusive Oyster Pond Association offering pond and beach access and conveniently located just minutes to downtown Edgartown, Vineyard Golf Club, and the Martha's Vineyard Airport. Enter into an open living and dining room space lined with a row of large sunny windows and screened doors to let the outside in. The living room takes advantage of the stunning property views over the stone terrace. A comfortable den is designed with built in bookshelves, a stone fireplace and more French doors leading out to the terrace. A connected glass hallway brings you to another casual sitting area with a TV and office space and a separate staircase leads to a private wing with a bedroom and bath. The kitchen is positioned in the middle of this floor with stainless appliances, Corian countertops, and lots of custom pantry space. The open story second floor overlooks the area below and is layed out with three bedrooms including a sunny master suite with private bath. Attached by an open breezeway, enjoy the finished room above the garage as an office or artist's studio.